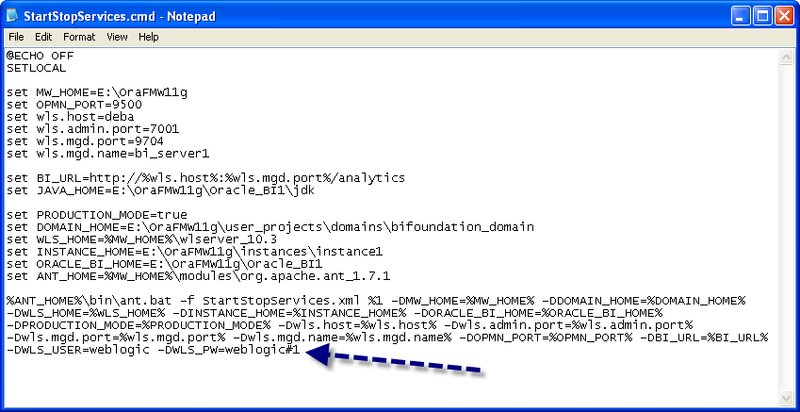 OBIEE 11g Errors: Root XML Node nqw not found in island! 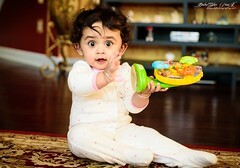 March 27, 2011 July 20, 2012 Debashis Paul Errors/Bugs/Issues, OBIEE 11g	Root XML Node nqw not found in island! Gosh… I got a strange error today while building one of reports using Answers. The error suddenly appears as “Root XML Node nqw not found in island!” after I modified the report and run it in the dashboard . The main concern is that the error appearing while I am trying to edit the request. The error is so annoying that I am neither being able to modify the request and nor being able to run this (actually it is throwing error) . Reason why it is appearing is , I was just define one presentation variable against the Multiselect Product name and prompted that in the reports criteria filter section . And after running the request it starts throwing this absurd error !! I am not being able to come out from the issue even after logout and clearing the browser session . 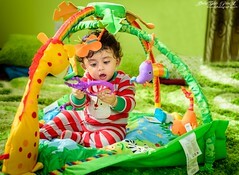 This could be resolved by editing the report content using Catalog manager and removing the buggy presentation variable . I have not done much r&d with this report and leave it as it is …. So buggy and frustrating error !!! 😦 I will try to replicate the behavior in a similar but small prototype just to nail down the issue and will update into thread if I find something really useful . 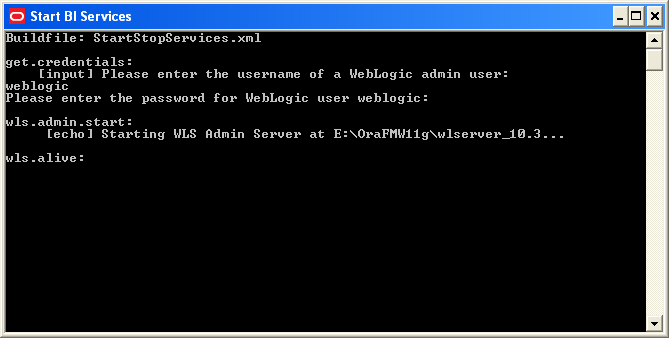 It’s always annoying to put Weblogic server username and password on server start-up and shutdown. It would be nice if the process could be automated. There are two different approach for this. Making this as Windows Service and set it as ‘Automatic’ in Startup Type .Other controllable approach is to manipulate the StartStopservices.cmd file of weblogic to pass the weblogic user name and password variable with a hard-coded predefined value . While starting up all the OPMN managed processes i.e trigger start button from Business Intelligence (coreapplication) module of OBIEE 11g Fustion Middleware EM console ,I got and error that failed to start all the processes. EM-02694 – Supplementary information regarding operation : BI_INSTANCE:coreapplication;FAILED_TO_START;Error in starting one or more components of BI Instance; Please check the server log files for detailed message. Actually the reason for the surprise came later when I see OPMNCTL status showing all BI Sys component processes are Alive . 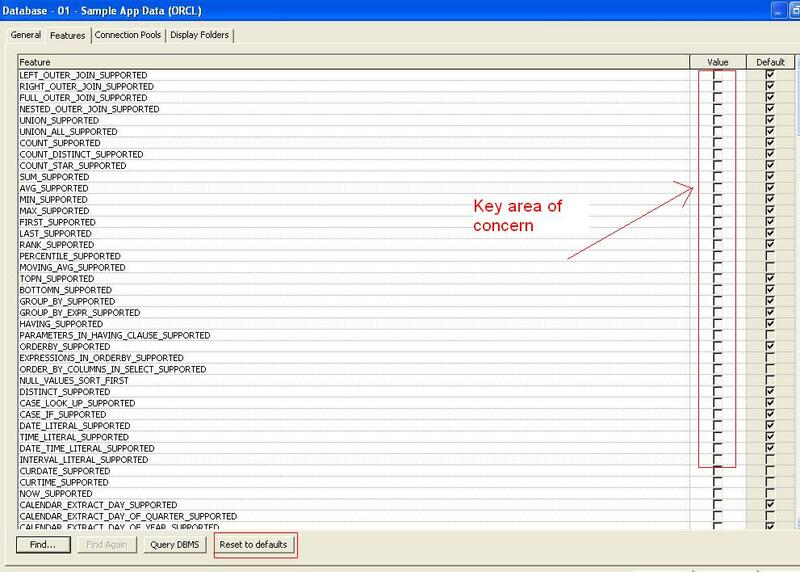 I can login to application and browse through the reports as well . Now while I refresh the EM page I can see all processes are up with the green status. So something really is not in sync. Possible reason OPMN and EM communication syncronisation ?? Don’t know …. So thumb rule, as per this release, don’t rely on EM message on server issue and log …rather see if OPMN managed processes are up and running fine or not . OBIEE 11g Error : NQSerror 42016 – Check database specific features table. Must be able to push at least a single table reference to a remote database. March 20, 2011 Debashis Paul Errors/Bugs/Issues	NQSerror 42016, NQSerror 42016 - Check database specific features table. Must be able to push at least a single table reference to a remote database. Note that: This issue could be with the SampleAPP.rpd which come as free application in OBIEE 11g Shiphome build . The behavior has been found in current release of OBIEE 11g .The same problem persist even if you upgrade the OBIEE 10g RPD to 11g version. The problem has been found during “metadata import using the TNS having OCI 10g/11g drive”r or while “view data in RPD” . The DB connectivity seems okay using command prompt or sqlplus option . ‘tnsping <service_name>’ from command return the response perfectly .So it is not the DB issue rather RPD is not being able to connect to DB . 1) Copied the ‘tnsnames.ora’ from Oracle DB path “E:\OraDeba11gR2\product\11.2.0\dbhome_1\NETWORK\ADMIN” to “E:\OraFMW11g\Oracle_BI1\network\admin” doesn’t resolves the issue fully . 2) Create a Environment System variable in windows advanced option of system properties called as ORACLE_INSTANCE and set the value as ‘E:\OraFMW11g\instances\instance1′ (without quote) . 4) Restart the BI Server . The reason behind the issue is that, till earlier release of OBIEE 1og doesn’t bundled with the Oracle client hence the required drivers and all the DB connectivity has been done using the default native Oracle driver(having single look-up point for tnsnames.ora) .But OBIEE 11g itself includes the Oracle client bundle, hence connecting from repository will always try to look-up the tnsnames.ora file inside the Fusion path rather 11g DB network\admin path .So copying the same TNS file across two path resolves the issue. 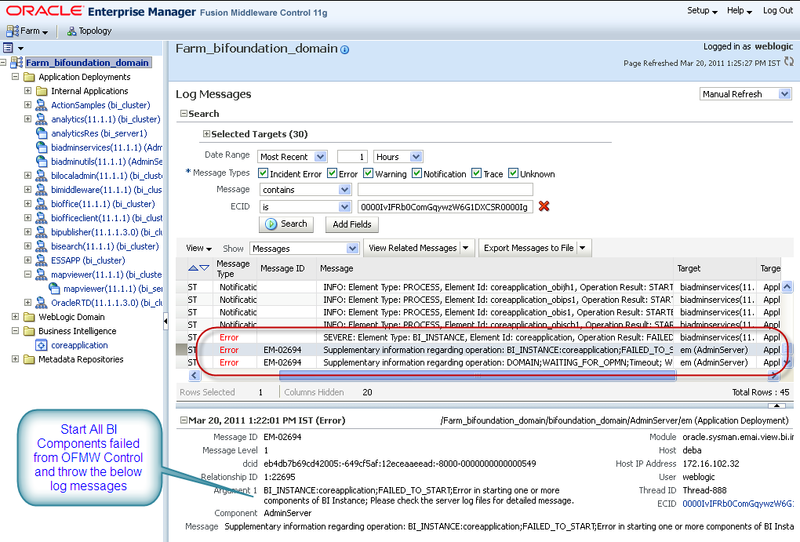 Hopefully Oracle will fix the issue in later release just to pick the absolute reference of Oracle DB path always. All the components are alive except coreapplication_obips1. There may be various reason to it and one of the obvious reason is Loop-back adapter not configured for DHCP client . The another main reason is any mistake at ‘instanceconfig.xml’ file .Any mistake in instanceconfig.xml tag placement could cause the issue of BIPS not starting up properly .Just correct the issue if did any changes and try to restart the service individually from EM UI . Hope this could help somebody as it is very difficult to dig into issue just because of the junk OBIEE log file 😦 So tip is , do think and not blindly incorporate ! !